VATICAN CITY (CNS) — A relationship with Mary, the mother of God, is not “optional” for Christians, Pope Francis said, because Jesus points to her as a source of protection and guidance. Wherever people have opened their doors to Mary, “the devil doesn’t come in; wherever the Mother Mary is, turmoil will not prevail, fear will not win. Who among us doesn’t need this? Who among us is not sometimes in distress or worried?” he asked in a morning homily Jan. 28. The pope celebrated Mass at the Basilica of St. Mary Major on the feast of the formal installation of the basilica’s Marian icon, “Salus Populi Romani” (health of the Roman people). The icon had been extensively restored in time for the day’s celebration. 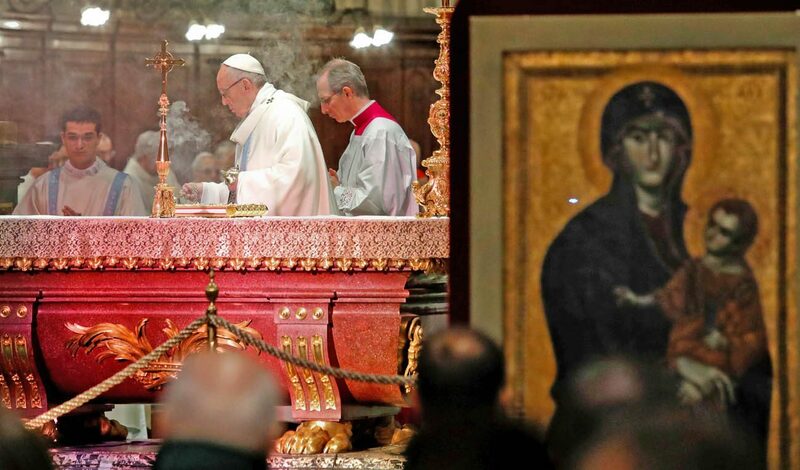 Pope Francis is particularly devoted to the icon, which has had a place in the hearts of Rome citizens since the 16th century when their prayers to be saved from the plague seemed to be answered after the image was carried through the city streets in a procession. In his homily, the pope recalled how Christians have always turned to Mary in times of trouble and difficulty. “How many times the heart is a stormy sea, where waves of problems swell and the winds of worry do not stop blowing? Mary is the ark, safe in the middle of a flood,” he said. “It won’t be ideas or technology that gives us comfort and hope, but the face of the mother Mary — her hands caress our life, her mantle shelters us,” he said. “You can’t be neutral or detached from the mother, otherwise we lose our identity as children and as people” of God, he said.